It seems as though every year we have a scare in Europe and, if it’s not Greece, then it’s another member of the infamous “PIGS” countries (Portugal, Italy, Greece, and Spain). This year, Italy is in the spotlight and strategists are paying attention given the country’s large debt burden. 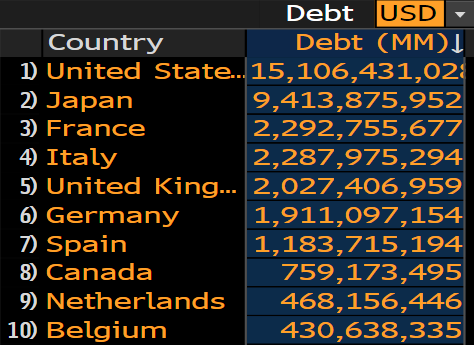 When you look at the top 10 debtors of the world, Greece doesn’t even make it into the top 10 club while “Little Italy” competes with France at just under $2.3T for the world’s number 3 spot. In terms of perceived default risk, when we rank sovereign countries by their 5-year credit default swaps (CDS), Greece still holds the top spot with Italy coming in at number two. Source: Bloomberg, Financial Sense® Wealth Management. Past performance is no guarantee of future results. While Italy’s 5-yr CDS at 214 looks high, at the height of the Eurozone crisis in 2011-2012, before the ECB came to the rescue, it jumped to almost 600 (red line below) and their 10yr sovereign yield (black line below) jumped to 7%. With the ECB taking a page from former Fed Chairman Ben Bernanke’s playbook, they are looking at “tapering” their monthly sovereign debt purchases this year with the slated goal of ending the program by year end. By losing the biggest buyer of European sovereign debt this year, interest rates are starting to move up, pushing up default risks in tandem, given the increased costs to finance the PIGS’ massive debt loads. This is exactly what we are now seeing in Italy. 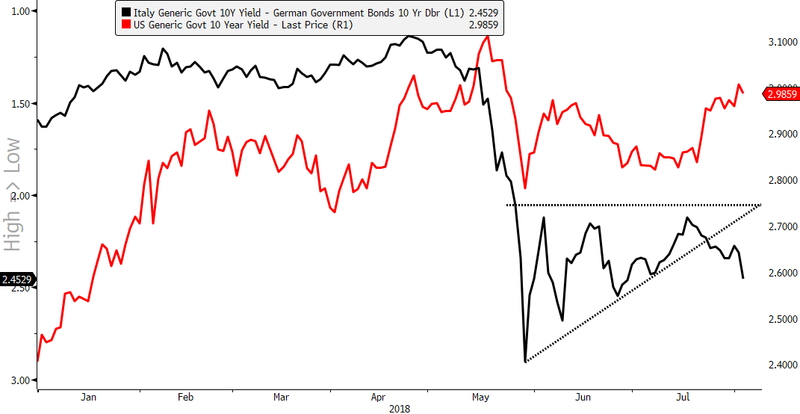 When European scares occurred in the past, investor capital fled higher risk sovereign debt in the PIGS countries (the periphery) for the safety of German bunds (the core). 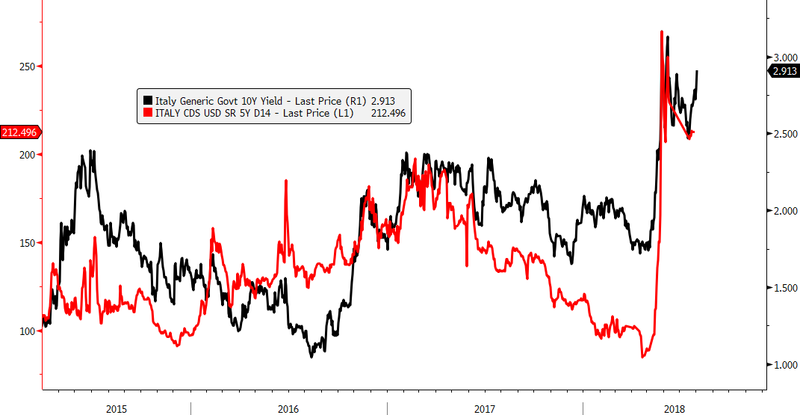 By measuring the yield spread between these two areas, not only can we monitor the level of capital flight within Europe but also the spillover effects as money moves into US Treasuries, which puts downward pressure on rates. 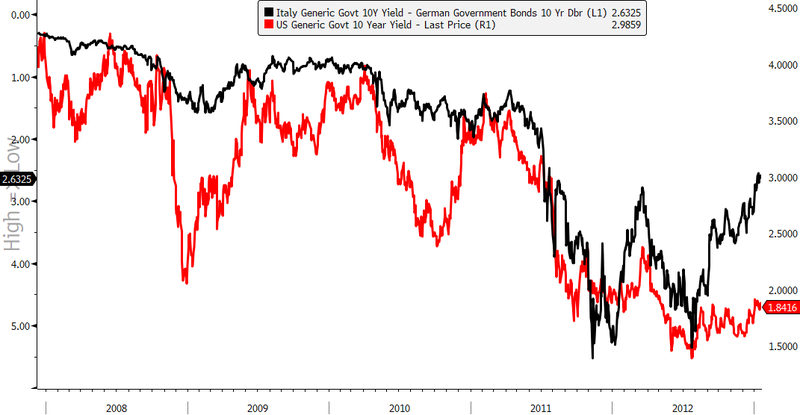 We can see this historical relationship below in which Italian-German 10yr sovereign spreads are shown in black and inverted (down is up, up is down) for direction similarity with US 10yr rates. 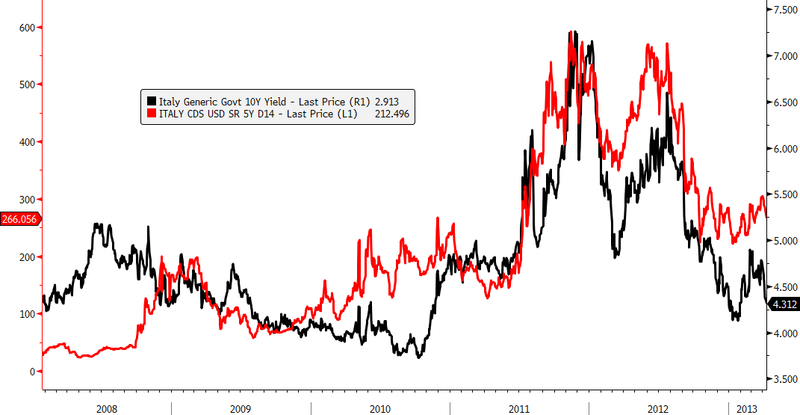 When Italian-German spreads moved up, our interest rates moved down and vice-versa, as seen below.